Purpose of Exercise: Provide students with an appreciation of the importance of using a rigorous scientific approach to the study of functional morphology. 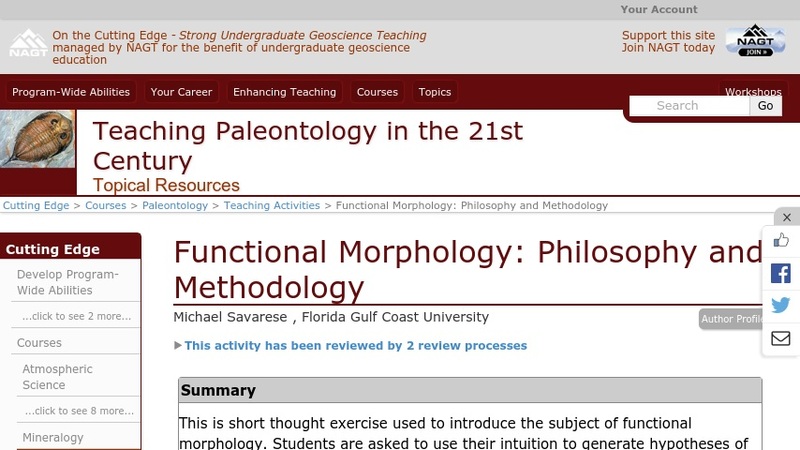 Students are asked to intuitively interpret the function of fossil skeletal morphologies. From this they identify a variety of genuine methodologies used in functional morphology, appreciate the importance of using multiple approaches, and realize how easy it is to generate untested hypotheses of function (i.e., adaptive storytelling). Materials: Class breaks up into 4 groups of 4 students. Each is presented with a fossil or shell from an invertebrate animal. The shells provided: (1) modern Nautilus, sliced laterally to show the chamber walls; (2) Archimedes bryozoan, just the helically spiraled core of a colony; (3) fossil scaphopod; and (4) fossil gastropod with spines along the apertural lip. Only the group with the gastropod should know the phylogenic affinity of the fossil: tell this group the shell is of a gastropod. The groups with the Archimedes and the scaphopod are asked to interpret the function of the entire shell; they should not be told whether or not the entire skeleton is represented. The Nautilus group is asked to consider the function of the chamber walls. The group with the gastropod is asked to consider the function of just the spines. Procedure: 1. The groups are asked, based on their intuition, to interpret the function of their shell or structure. (5 mins) 2. Without inquiring about their specific interpretations, the groups are then asked to think about what methodologies, philosophies, or logical approaches were utilized to make functional inferences. (5 mins) 3. Each group reports back. 4. On the board generate a list of the approaches identified. These should reflect many of the formal methods recognized within the discipline. Note how interpretations are tenuous or flawed when based on merely one approach; also note mistaken functions because of wrong assumptions or misapplied methods. (10 mins) 5. Follow this with a short lecture / discussion reviewing the formal methods employed in functional morphology. The following files are uploaded as supportive teaching materials: 1. Lesson plan with the "conceptual change model" outline.